Waking up an hour earlier than normal, I was excited for the state of complete exhaustion which would overtake our team after our two water stops. My own modestly exercised body was pushed to the limit on our first water truck day, so I naturally expected the same to happen today. As we sat around the breakfast table, we learned that the rain had made the roads to Cite Soleil too difficult to drive on, and the entire endeavor of giving out water was deemed illogical by the drivers who reasoned that the rain would provide people with enough water for the day. After a unanimous decision, we made our way to an orphanage for sick and dying babies. Chance the Rapper has this song where he talks about negative things actually being blessings in disguise. Today was one those scenarios. Being there with the babies reminds me of that scene in the Rugrats Movie (a Carrillo family favorite) where all the babies sing and dance. There are so many tiny babies with distinct personalities, it's just awesome. The difference is that the babies we were with are in various stages of disease and malnutrition. I read somewhere that the most distressing sound for human beings is a baby crying, and the most pleasant sound is a baby laughing. Needless to say, this was one of the best and hardest experiences for us. It's just human nature to love babies. And babies love us too. 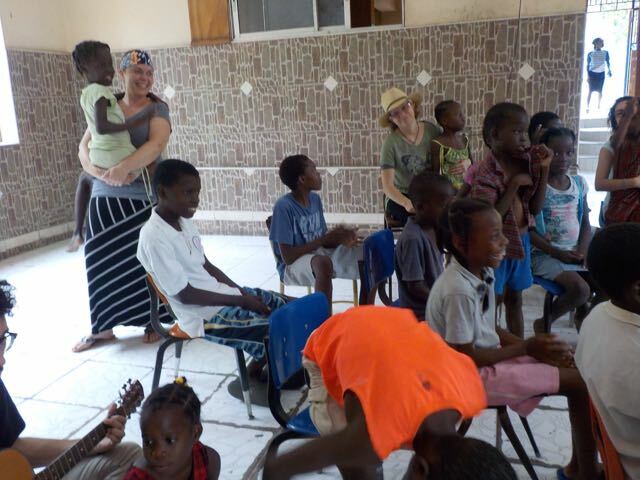 We went to another orphanage afterwards, LaPherre's, where we sang and made crafts with some kids. These kids weren't as antsy as the kids from yesterday, who could hit that nae nae, and I thought were lots of fun (although I wasn't in charge so I just rejoiced in the middle of the chaos with a little girl meticulously decorating her styrofoam cross). These little guys sang and clapped and danced happily, but politely. One little girl chugged a frozen soda afterwards, a reward for her hard work. I was eventually approached by a little girl who wanted to go on my shoulders. Never having attempted this before, I was terrified for her safety, but eventually got her up with the help of Al. We watched as the rest of the team played jump rope with some girls who put us to shame, or talked to some of the kids who wanted to practice their English, or just sat with some children who wanted to be held. One little guy sat smugly placing stickers on his face. When I gave him a thumbs up and told him I liked his style, he just shot me this cool look that said "I know; I'm awesome". These visits to orphanages always seem too short, but I know that they have a lasting impact for the kids we get to interact with. Our day ended at Fleri Bakery, a bakery created for Haitian job creation. Down the hill from Grace Village, a young man about my own age took our order for pomme frites, Haitian Kibe (a delicious empanada type food), papitas and mango salsa, and three different pizzas. This young man is part of a program that seeks to give applicable skills to kids transitioning from school to the real world. He understood our orders given to him in 100mph English, smiling as he brought us our feast. Throughout the week, I have noticed that there is a generation of young Haitians growing up in the most interconnected world ever. They have grown up in a Haiti of relative stability (compared to the past) and incredible optimism. You can feel the hope manifesting itself into tangible reality. For example, the road outside our guest house is currently being paved. We had to walk about two blocks because of the dirt and machinery blocking our path, a small price to pay for the progress of an amazing country. Last year, I watched this movie where this guy talked about his life growing up as a Korean orphan in (I think) Belgium with his adoptive family. The South Korea of a generation ago, filled with war and poverty and pain, is nothing like the South Korea of my generation, filled with "Oppa Gangnam Style! ", delicious barbecue, and makeup gurus. Perhaps the Haiti of my children's generation will carry similar connotations. I really hope so. The people here deserve it. They are kind, and strong, and fun, and just love life so much. In closing, I have to quote the great California native Ice Cube, "Today was a good day". Hi - Dan here, ready to write my reflections on what our team experienced today on Day 4 of our Healing Haiti trip. 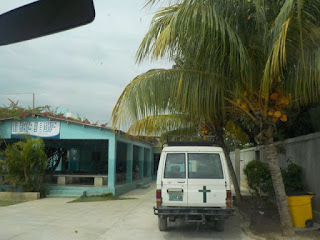 Today our LIFE began with an early wake-up call so we could attend the 6:00 a.m. worship service at The Church on the Rock, a Haitian megachurch where many Haitian Christians begin their day, every day, worshiping God before going to work. It is definitely something to see and experience; like nothing most of us have ever witnessed before: people walking and praying and waving and singing and kneeling and swaying, praising and interceding and beseeching the Lord with talented musicians and worship leader moving the service along. After breakfast, our LIFE took a surprising turn. We loaded our tap tap with all of our gear for the day - and promptly unloaded it into a substitute tap tap because our vehicle had an oil leak problem. Then we proceeded to our first ministry opportunity of the day at the Home for Sick and Dying Adults, an incredible care facility that seeks to bring comfort, healing, and LIFE to hurting Haitians. No photos are allowed, and so we can't show you what it is that we were part of. But we all agree that it was a beautiful, challenging, rather intimate relational experience where we were welcomed into the wards of the men and women to massage and relieve their aching bodies. We don't know exactly what each patient's ailment was, but their responses to our ministrations were beautiful to behold. We usually began by applying lotion to their legs, gently rubbing this soothing balm into their thighs, calves, legs and feet (a good opportunity to practice reflexology on the very tough, calloused bottoms of their feet!). Next we moved on to their arms and hands, easing their biceps and forearms with long, careful strokes and deeper pressure on their palms and between their fingers. The men then quickly pulled up their pajama tops, eagerly waiting for more massage on their stomachs, chests, and backs. No shyness, no awkwardness, no modesty at all - they simply opened themselves to the LIFE-giving touch we offered their sick and hurting bodies. I could see the peace and release in each man's face and in the way their shoulders and necks relaxed as I wiped lotion on their front torsos and pushed in more deeply on their backs, pressing out the tension and stiffness from whatever illness had them bound up. One man smiled and sighed and slowly nodded his head, affirming the healing touch I was giving him. Another man, Joshua, reached out and grabbed my hands when I finished with him, thanking me with smiles for the massage I had offered him. Altogether, I ministered to nine or ten men, and when the bell rang to summon us out of the wards, the four of us - Al, Sam, Emmanuel, and myself - were delighted to learn that we had massaged every single male patient! It was the same with the women. Not one patient was neglected. The LIFE of each one was personally acknowledged and touched. Thanks be to God! Following our lunch in the tap tap and a visit to the Haiti National History Museum, we experienced LIFE in a very different way: with about 40 very active children at the LaLoo orphanage. Despite what we would probably consider a dire living situation (life in in orphanage in downtown Port-au-Prince, with limited resources and opportunities), these kids were an active, loud, happy, relational bunch that were mighty hard to corral and do activities with. We sang songs with them (you should've seen the boys and the girls try to master their part on "Hallelu, hallelu, hallelu, hallelujah! Praise ye the Lord! :), laughed through an extended version of "If you're happy and you know it, clap your hands" in Creole with our driver, Max, keeping the beat on a cajon, and then every one of us got pulled into a huge "dance-off" with the kids leading the way (my "step" was a rhythmic version of my famous "bear rug imitation" flat out on the floor - what else?!). Next we pulled out a frisbee, soccer ball, hackey sacks, and bubbles for the kids to enjoy. Our final activity was a craft, organized by Norma, that highlighted the Resurrection: large cross necklaces that each child could decorated with a variety of stickers and jewels, expressing their own unique design and creativity - the special, energetic LIFE that God has placed in each one of them. This theme of LIFE has been one that the Lord has been pressing into my consciousness throughout this week in Haiti. I'm seeing this country and this people differently than in my past two trips to this very beautiful island nation. In the past, I had a hard time seeing past the poverty, the hardships, the brokenness, the needs, the leftover devastation from the 2010 earthquake - what you would expect in the poorest of all the countries in the western hemisphere. But this time it's different. Through Healing Haiti's incredible work, partner ministries, seeing new construction projects, job creation opportunities, organizations that improve the lives of both children and adults (Haiti Initiative, Apparent Project) - this time I see new LIFE/new hope/a new future for this country and this people. What a privilege to have even a very tiny, small part in bringing this future to fruition. Glwa pou bondye! Glory to God. One other thought, which is also related to LIFE. We learned this week that the suicide rate in Haiti is very very low. Haitians seek LIFE, no matter what! Yet from the perspective of us in the USA who have so much, we might wonder: Why? When you see the hard lives of the Haitian people, many living in tiny shacks, needing water delivered to their neighborhoods, unsure of where their next meal might come from, lack of medical care, lots of unemployment, almost none of the material comforts, securities, and opportunities that we in America can't live without, you have to wonder: why do they strive so hard, at all costs, for LIFE? Then, consider the USA, and the suicide rate in our country. In a nation where we, its citizens, have so much to make LIFE rich and comfortable and secure why do so many choose "not-LIFE?" Why is the suicide rate so high in America? Taking this attitude a step farther, what about abortion and now euthanasia in our country? The attitude that some are better off with "not-LIFE" (not wanted, not convenient, a hardship, better off terminated......) Ah! As I interacted this week with little Haitian children with deformities, no parents or guardians except an orphanage, infants close to dying, elders living alone in rural Haiti in tiny shacks - people living the very lives that I fear all-too-many in America would consider better off with "not-LIFE," I have to say that we in the richest country in the West have a whole lot to learn from this amazing country of Haiti when it comes to values, priorities, and the meaning of LIFE. Again, I thank God for the insights and the way my heart and life are enriched by sharing LIFE with the Haitian people.